1. Type Q86-324/75(33/8-123/4 in) drilling manual tong is a vital oil drilling tool used to fasten or remove the screws of drill pipe and casing joint or coupling. 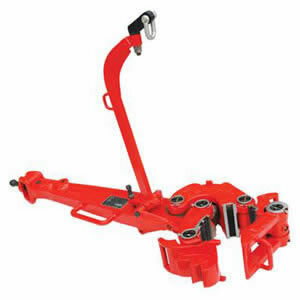 It can be adjusted by changing latch lug jaws and latch steps. 2. Type Q31/2-17/90 drilling manual tong is used to make up or break out the screws of drill tools and casing joint or coupling. It can also be adjusted by changing latch lug jaws and latch steps. LATCH LUG JAWS HANDLE OD MM(IN) TORQUE MAX.KN.M. LATCH LUG JAWS HANDLE OD MM(IN) TORQUE MAX.KN.M. At Rugao Yaou Company, we are committed to providing quality oil drilling equipment at low prices. In addition to drilling manual tongs, we also offer other oil drilling tools to satisfy your different requirements, such as drill pipe slips, drill collar slips, and side door elevators etc. Located in Rugao, Jiangsu, we are near highways, airports, and sea ports. This facilitates the transport of goods and reduces shipping costs for our customers. Our drill pipe slips are applicable to drill pipes from 23/8 to 51/2 inch (60.3-139.7mm) O.D. According to gripping length, they are classified into Short (SDS) type, Medium (SDML) type and Extra Long (SDXL) type.